Single-foment system for hot/cold treatment. RYL Single-foment System offers a simple way to administer moor mud pack (BALNEO-Peat) treatment without the requirement of facilities and equipment typically associated with it. While the system is not intended for a reduction body wrap, it offers the same curative effects as standard (loose) moor mud packing in a much cleaner and a less laborious way. 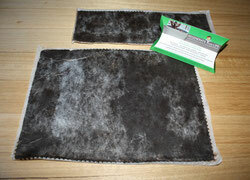 The system consists of a Single-foment moor mud detox pack and a matching hydro collator pack (heat carrier). The key component is a unique single use moor mud pack - a layer of organic moor mud (balneo peat) sealed between permeable membrane and leak-proof plastic sheet. The membrane allows for contact between skin and mud, yet prevents mud to stick to skin. The system is designed to deliver constant increasing heat to the treated area for a length of a physiotherapy treatment (20 – 30 min.). After application the pack is easily removed and skin can be cleaned with just a towel. Thanks to its simplicity, the labor requirement (as well as training) is minimal. Action: Joint and muscle pain relief / Mobility improvement / DetoxificationRYL Moor packs are made from natural Moor Mud (Balneo-peat). Moor mud has a number of actions and properties. In brief, these actions stimulate blood flow, draw toxins, provide nutrients and provide deep consistent heating. Stimulating blood flow is necessary when complaints of muscle stiffness, fatigue, weakened immune function, chronic pain, muscle spasms, cold extremities, chronic injury, poor healing tissues and post-workout soreness. A lack of blood flow to an area leads to poor oxygenation delivery, poor metabolite removal (such as carbon dioxide, urea, and lactic acid), poor nutrient delivery and poor delivery of immune cells. Over time, these problems may lead to joint degeneration, pain, stiffness, cancer, malnutrition and chronic disease. Moor Mud is rich in humic and fulvic acids, which in nature provide the vehicle for delivery of minerals and other nutrients. They also have chelatic properties and form strong bonds with heavy metals and toxins to make them impossible for tissue to absorb. Muscle spasm, pain, joint dysfunction, immobility. Wound application: poor healing, wound post-op. Note: If there is hypertension, mud packs are welcome as symptoms may be relieved locally with a mud pack application since bathing in hot water may be contraindicated.